Viognier was introduced into the state of Virginia by Dennis Horton in 1991. He was met with a lot of opposition, being told it would not grow or produce enough fruit. 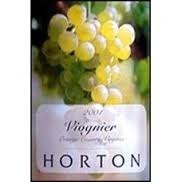 Horton released Virginia's first Viognier in 1992 and produce the worlds first sparkling Viognier just 6 years later in 1998. Dennis has received world wide attention for his Viognier. Dennis Horton started "Viognier is the red drinkers white." It is full bodied, bold white has honey aromas and smooth peach and apricot flavors.